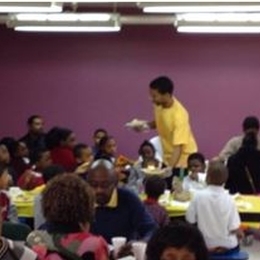 The Sinclair Men's Basketball team started their Thanksgiving break November 26 continuing a Sinclair tradition of serving Thanksgiving Dinner at the Dayton Boys & Girls Club. The mission of the Boys & Girls Club of Dayton is to inspire and enable all young people, especially those who need us most, to reach their full potential as productive, caring, responsible citizens. Since 1930, the vision of the Boys & Girls Clubs has grown and changed with the needs of our children and so will the dynamics of our programs and services. The Boys & Girls Club of Dayton provides some 1,000 youth in the Greater Dayton area with a safe and positive place to learn and grow.